It’s becoming increasingly popular to create a website that is just an article or story about a single subject, perhaps a journal, a report, a holiday or a product review. These are not really like regular blogs - but just a single column of text, presented in a nicely designed layout intended to focus your attention on the content - with little superfluous clutter or advertising. I’m going to show you how easy this is to create using Xara Web Designer Premium or Xara Designer Pro. What’s more this is a responsive website, so it works on narrow mobile screens such as phones, and includes a few fancy effects such as a fading heading and parallax scroll effects. This article is itself an example of such a design. The ‘Make it Easy’ Shortcut! This tutorial takes you through the process of creating the website from scratch, but to save you time, you can download this ready-made template if you wish, and just replace it with your content. Download the template and (if you don’t already own it) download the Web Designer Premium trial version. Simply drag the template into Web Designer to open it. For maximum readability it’s often recommended that lines should not have more than around 15 words per line - longer than that and the eye has more difficulty moving from the end of one line to the start of the next. So this column width, in combination with the font and font size, is the upper end of that recommendation. I would not have the column width any wider than this. The Font I’m using here is a Google font called Droid Serif, 16px size (which is the equival- ent of 12pt in print terms), so quite large, using a generous 125% line spacing. Some studies suggest using serif fonts improve readability. Certainly it’s more common for longer text stories, such as most novels, to use a Serif font like this. This design is based on a 960px wide blank web template: File > New > Web page 960 px. The column width is only 700px so I could have used a 760px blank template, but it’s better to have a larger photo (explained below), so I have gone with the wider page size. 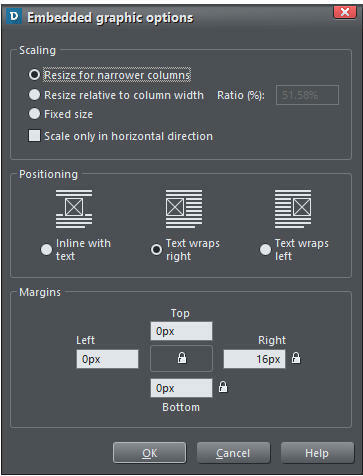 By default, web page documents are a fixed height - you usually have to drag the bottom edge of the page down to adjust the vertical page size, but for documents like this you can set the page size to automatically stretch to accommodate any column height - so it expands as you add more text. To do this, select the text column in the Selector Tool (not in the Text Tool), and use the context menu options (right click) Position on page > Push... This brings up the following dialog. By setting the text column to Push, it makes the page expand (and would push anything else below the column that also had the Push attribute set). As you can see I have set a Bottom margin of 45px - the other values do not matter. Which means there’s a nice margin below the bottom of the text and the bottom edge of the page. So now as you add or remove text the page expands or shrinks to accommodate the text. A large eye-catching photo is common at the top of web stories. The image used here is set to stretch to the full width of the browser window - try adjusting the window width to see what I mean. It’s really easy to make any photo behave like this. Select the photo (or other object such as a rectangle) and use the right click context menu, or the main menu: Utilities > Web Sticky/Stretchy... which shows this dialog. Select the ‘Full width’ option as shown here. The ‘Scale origin’ setting affects how the photo enlarges as you make the window wider. Below the photo I’ve drawn a thin rectangle which is also set to be full width stretchy, and I’ve also set it to ‘stick at top’, so that when it reaches the top, as the page is scrolled it sticks (I’ve done the same for the buttons, see below). If you’re using the ready-made template, you can just drag and drop to replace it with any picture file from your Windows File Explorer. If you have already imported the photo, say from the free Stock Photos category of the Content Catalog, you can swap the photo by dragging the appropriate image from the Bitmap Gallery (the tab on right edge of the window). Swapping the image this way retains the current proportions and keeps its parallax scroll setting. Parallax Scrolling You might have noticed that as you scroll the page up the photo at the top doesn’t scroll quite as fast as the rest of the text. This is a parallax effect. You can control the scroll speed of anything on the page via the Web Animation dialog. 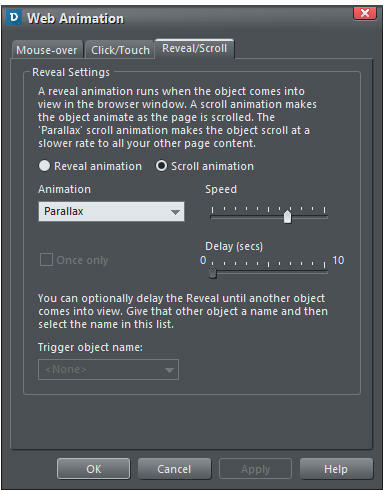 So select Utilities > Web Animation to display this dialog: For the photo at the top of the page I have selected the Reveal / Scroll tab, the Scroll animation option (not Reveal) and chosen the Parallax option from the drop-down list with the speed set as shown. There’s a huge list of other reveal and scroll options you can experiment with if you wish. But note most scroll options are intended to control how objects appear as they are scrolled into the visible area. Just as a comparison, I set this Web Animation dialog to have a Reveal Animation of Zoom/fade in. Scroll this text off screen and back on again to see the effect repeated (I would not recommend you set it to repeat every time like this - there’s a check box ‘Once only’ that makes the animation happen only the first time it’s scrolled on screen). Replacing the top photo with your own is described above. But it’s easy to add your own photos inline in this document. Firstly, import the photo (drag ’n’ drop a photo onto the page, or choose Insert > Image menu). To put it inline, so the photo moves with the text, just copy or cut the photo, place the text cursor where you want the photo to go, and paste - the image now becomes an inline image. With the recent 365 releases we added a new way to adjust the wrapping of text around a photo. 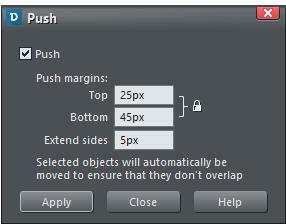 Just right click any inline image and select Embedded graphic options, which displays this dialog. Most of the images in this document have text wrapping around the right or left side. There’s usually no need to adjust the margins as it automatically gives a small margin in the appropriate place, so the text does not abut the image, as here. If you insert large images they are resized to fit within the column. This is important for mobile screens - see the Responsive Website section below to find out more about that. A really good trick to instantly make your website look more attractive and ‘designed’ is to repeat a predominant color from your main photo throughout the design. So in this case I have a picture of predominately beige and browns (picture from the completely free Stock Photos section of the Content Catalog). So I have used a reddish brown color for all the graphics and headings throughout the document. All the Xara Designer titles support color styles. These are named colors (a bit like text styles), that you can use anywhere you like. If you change the definition of the named color, all corresponding parts of your document are instantly updated. So in this document the color is named ‘Theme Color 1’. You can see the color patch on the left end of the color line. It’s very easy to change the Theme Color 1, just right click on the color patch on the color line and select Edit Theme Color 1. Here’s another example of a website, based on this template, where I’ve used a different header photo and picked a color for Theme Color 1 that matches it. The two links under the top photos are simply web buttons, manually placed under the thin rectangle below the photo. Like the rectangle I’ve set them to ‘stick at top’ by right clicking on them and selecting Web Sticky/Stretchy... and checking Stick At Top. To add more buttons, it’s probably easiest to copy one of the existing ones, and just edit the text and link as required. But you can add different designs from the Content Catalog; Select Insert > From Content Catalog, then choose Components > Web & Print Components > Buttons. Make sure you choose ‘Match styles’ when prompted to ensure the button color matches your Theme Color 1. By the way, the buttons have a subtle mouse-over highlighting effect when published. Here’s an example. Just click on the button text to edit it. You will probably need to re-position the button afterwards as its width will change according to the text. More people now read websites on mobile narrow-screen devices than large screen desktop screens. And this trend is only set to continue, so creating a website that’s optimized for mobile screens is increasingly important. Web Designer and Designer Pro have the ability to create mobile friendly versions of your website - we call them variants. So when creating this design I’ve set up a mobile variant which means I have two versions of the document, and two document tabs. The WebStory document has two tabs, one for each variant. The key point is that all the content is shared across both variants - when I edit the text, or add a picture, it’s added to both variants, but I also get the option to re-arrange the layout for the mobile variant to be more appropriate for narrow screens. I have made some changes to the layout of the mobile variant - reduce your browser width, or view the page on a mobile to see these. The mobile version is fully justified, and auto- matic hyphenation is turned on, to better fill out the column. So as you can see it’s possible to have different Styles for the presentation of the same content in the mobile version. Also where you wrap text to the left or right of embedded images it’s usually better to just have the image inline on the narrow screen. So using the Embedded graphics options menu (right click on the image) you can change this for the mobile variant only, as well as the margins if any change is required. That’s it. So easy that anyone can do it! To use more of the advanced layout controls, e.g. to adjust the fonts or styles, or to change the animation options, you currently have to use the desktop version of Web Designer or Designer Pro - although if you save the file in your cloud drive, then you can edit the same file in Online Designer and the desktop Designer. Xara Web Designer Xara Web Designer is unlike any web design software you will have seen before; it’s an easy template based solution that gives you total page design freedom, no HTML skills required. It comes in 2 versions, Web Designer and Web Designer Premium that offers advanced web design features. More information. Give it a try! Download Web Designer trial version and the Web Story template. This tutorial takes you through the process of creating the website from scratch, but to save you time, you can down - load this ready-made template if you wish, and just replace it with your content. Download the template and (if you don’t already own it) download the Web Designer Premium trial version . Simply drag the template into Web Designer to open it. For maximum readability it’s often recommended that lines should not have more than around 15 words per line - longer than that and the eye has more difficulty moving from the end of one line to the start of the next. So this column width, in combination with the font and font size, is the upper end of that recommendation. I would not have the column width any wider than this. The Font I’m using here is a Google font called Droid Serif, 16px size (which is the equivalent of 12pt in print terms), so quite large, using a generous 125% line spacing. Some stud - ies suggest using serif fonts improve readability. Certainly it’s more common for longer text stories, such as most nov - els, to use a Serif font like this. This design is based on a 960px wide blank web template: File > New > Web page 960 px. The column width is only 700px so I could have used a 760px blank template, but it’s better to have a larger photo (explained below), so I have gone with the wider page size. By default, web page documents are a fixed height - you usually have to drag the bottom edge of the page down to adjust the vertical page size, but for documents like this you can set the page size to automatically stretch to accommod - ate any column height - so it expands as you add more text. To do this, select the text column in the Selector Tool (not in the Text Tool), and use the context menu options (right click) Position on page > Push... This brings up the following dialog. By setting the text column to Push, it makes the page ex - pand (and would push anything else below the column that also had the Push attribute set). As you can see I have set a Bottom margin of 45px - the other values do not matter. Which means there’s a nice margin below the bottom of the text and the bottom edge of the page. So now as you add or remove text the page expands or shrinks to accommodate the text. A large eye-catching photo is common at the top of web stories. The image used here is set to stretch to the full width of the browser window - try adjusting the window width to see what I mean. It’s really easy to make any photo behave like this. 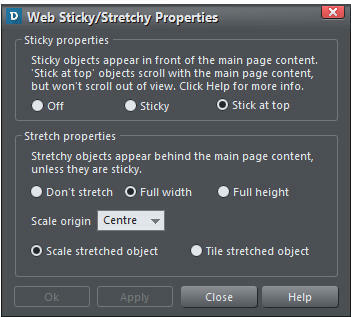 Select the photo (or other object such as a rectangle) and use the right click context menu, or the main menu: Utilities > Web Sticky/Stretchy... which shows this dialog. Select the ‘Full width’ option as shown here. The ‘Scale ori - gin’ setting affects how the photo enlarges as you make the window wider. Below the photo I’ve drawn a thin rectangle which is also set to be full width stretchy, and I’ve also set it to ‘stick at top’, so that when it reaches the top, as the page is scrolled it sticks (I’ve done the same for the buttons, see below). If you’re using the ready-made template, you can just drag and drop to replace it with any picture file from your Win - dows File Explorer. If you have already imported the photo, say from the free Stock Photos category of the Content Catalog , you can swap the photo by dragging the appropriate image from the Bitmap Gallery (the tab on right edge of the window). Swapping the image this way retains the current propor - tions and keeps its parallax scroll setting. Parallax Scrolling You might have noticed that as you scroll the page up the photo at the top doesn’t scroll quite as fast as the rest of the text. This is a parallax effect. You can control the scroll speed of anything on the page via the Web Animation dialog. So select Utilities > Web Animation to display this dialog: For the photo at the top of the page I have selected the Re - veal / Scroll tab, the Scroll animation option (not Reveal) and chosen the Parallax option from the drop-down list with the speed set as shown. There’s a huge list of other reveal and scroll options you can experiment with if you wish. But note most scroll options are intended to control how objects appear as they are scrolled into the visible area. Replacing the top photo with your own is described above. But it’s easy to add your own photos inline in this document. Firstly, import the photo (drag ’n’ drop a photo onto the page, or choose Insert > Image menu). To put it inline, so the photo moves with the text, just copy or cut the photo, place the text cursor where you want the photo to go, and paste - the image now becomes an inline image. With the recent 365 releases we added a new way to adjust the wrapping of text around a photo. Just right click any inline image and select Embedded graphic options , which displays this dialog. Most of the images in this document have text wrapping around the right or left side. There’s usually no need to adjust the margins as it automatically gives a small margin in the appropriate place, so the text does not abut the image, as here. If you insert large images they are resized to fit within the column. This is important for mobile screens - see the Re - sponsive Website section below to find out more about that. A really good trick to instantly make your website look more attractive and ‘designed’ is to repeat a predominant color from your main photo throughout the design. So in this case I have a picture of predominately beige and browns (picture from the completely free Stock Photos section of the Con - tent Catalog ). So I have used a reddish brown color for all the graphics and headings throughout the document. All the Xara Designer titles support color styles. These are named colors (a bit like text styles), that you can use any - where you like. If you change the definition of the named color, all corresponding parts of your document are in - stantly updated. So in this document the color is named ‘Theme Color 1’. You can see the color patch on the left end of the color line. It’s very easy to change the Theme Color 1, just right click on the color patch on the color line and select Edit Theme Color 1 . Here’s another example of a website, based on this template, where I’ve used a different header photo and picked a color for Theme Color 1 that matches it. The two links under the top photos are simply web buttons, manually placed under the thin rectangle below the photo. Like the rectangle I’ve set them to ‘stick at top’ by right click - ing on them and selecting Web Sticky/Stretchy... and checking Stick At Top. To add more buttons, it’s probably easiest to copy one of the existing ones, and just edit the text and link as required. But you can add different designs from the Content Catalog; Select Insert > From Content Catalog , then choose Com - ponents > Web & Print Components > Buttons . Make sure you choose ‘Match styles’ when prompted to ensure the button color matches your Theme Color 1. By the way, the buttons have a subtle mouse-over highlighting effect when published. Here’s an example. Just click on the button text to edit it. You will probably need to re-position the button afterwards as its width will change according to the text. More people now read websites on mobile narrow-screen devices than large screen desktop screens. And this trend is only set to continue, so creating a website that’s optimized for mobile screens is increasingly important. Web Designer and Designer Pro have the ability to create mobile friendly versions of your website - we call them variants. So when creating this design I’ve set up a mobile variant which means I have two versions of the document, and two document tabs. The WebStory document has two tabs, one for each variant. The key point is that all the content is shared across both variants - when I edit the text, or add a picture, it’s added to both variants, but I also get the option to re-arrange the layout for the mobile variant to be more appropriate for narrow screens. I have made some changes to the layout of the mobile vari - ant - reduce your browser width, or view the page on a mobile to see these. The mobile version is fully justified, and automatic hyphenation is turned on, to better fill out the column. So as you can see it’s possible to have different Styles for the presentation of the same content in the mobile version. Also where you wrap text to the left or right of embedded images it’s usually better to just have the image inline on the narrow screen. So using the Embedded graphics options menu (right click on the image) you can change this for the mobile variant only, as well as the margins if any change is required. That’s it. So easy that anyone can do it! To use more of the advanced layout controls, e.g. to adjust the fonts or styles, or to change the animation options, you currently have to use the desktop version of Web Designer or Designer Pro - although if you save the file in your cloud drive, then you can edit the same file in Online Designer and the desktop Designer. Xara Web Designer Xara Web Designer is unlike any web design software you will have seen before; it’s an easy template based solution that gives you total page design freedom, no HTML skills required. It comes in 2 versions, Web Designer and Web Designer Premium that offers advanced web design fea - tures. More information. Give it a try! Download Web Designer trial version and the Web Story template .